THE WEEKLY SUN RESPONSIBLE LOCAL JOURNALISM. • BELLEVUE • CAREY • HAILEY • KETCHUM • PICABO • SUN VALLEY • WHAT TO KNOW. WHERE TO BE. Crime & Courts News Hailey Men Are Home From Bundy Trial, But For How Long? The stein is your ticket! Two Foodie Events You won’t want to miss! PROCEEDS BENEFIT OUR EFFORTS TO CREATE A RESILIENT LOCAL AND REGIONAL FOOD SYSTEM. ON THE COVER Continued from page 1: ... The view from Muldoon Canyon, in Bellevue, was taken late in August, and shows the smoky sky above a passing storm. Photo courtesy Rob Marcroft For more information on the smoke and air quality, see News In Brief on page 8. Local artists & photographers interested in seeing their art on our cover page should email submissions to: mandi@theweeklysun.com (photos should be high resolution and include caption info such as who or what is in the photo, date and location). City of Ketchum A Wagon Days Thank You! Thanks from Mayor Nina Jonas to all who contributed to the success of Wagon Days and to all who attended! Special appreciation goes to City of Ketchum staff, Ketchum Police Department, Grand Marshal Stephen Pauley, VIP sponsors Lunceford Excavation and RJK Entertainment, who directed the successful concert with Lukas Nelson and Promise of the Real. And to Sun Valley Events and all of the sponsors, local businesses and vendors who helped make this event possible and the best it could be, thank you. Declaration of Candidacy Period Ends Sept. 8 Positions of mayor and two city council members are up for election on No. 7, 2017. Declarations of Candidacy must be filed with the Ketchum City Clerk at City Hall, 480 East Ave. N. no later than Sept. 8, 2017 at 5 p.m. Visit ketchumidaho.org/electionfor information and forms. Open Meeting On Thursday, Sept. 7, and Friday, Sept. 8, contract negotiations will take place between the City of Ketchum and Ketchum Firefighters Local #4758. This is a public meeting and will take place on both days from 9 a.m. to 5 p.m. in Ketchum City Hall. Keep Up With City News Visit ketchumidaho.org to sign up for email notifications, the City eNewsletter and to follow us on Facebook and Twitter. Email questions and comments to participate@ketchumidaho.org. 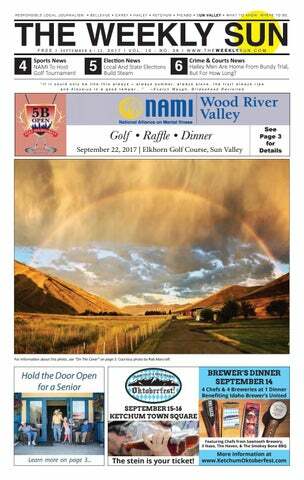 eptember is Suicide Prevention Month and, in conjunction, the Wood River Valley affiliate of the National Alliance on Mental Illness (NAMI-WRV) will host its second annual golf tournament to raise awareness about mental health conditions, support its ongoing community programs, and have a little fun. The tournament will take place on Friday, Sept. 22 at Elkhorn Golf Club. Funds raised will go to support NAMI’s free programs in the community. “Funds raised through this event help us pay for programs that we provide to individuals and families who have to live with mental illness on a daily basis,” said Curt ‘Coddy’ Mays, NAMI-WRV board member. NAMI, a national nonprofit organization, was created, and is run, to help people with mental illness throughout the country. NAMI-WRV is one of several Idaho affiliates. Mays said the organization’s mission is a dedication to “improving the quality of life for people with mental illness and their families through support, education, and advocacy, and to bridge the gap between urban and rural mental health services. “We have ongoing interactive support and educational programs that reach out to those affected by mental illness to make living, working, and playing easier,” Mays said. There are many programs within NAMI-WRV, including an active involvement at Wood River High School in Hailey with the Bluebirds, a NAMI-partner student organization that helps with offering resources and services to those living with mental and emotional challenges throughout the Valley. The organization also brings advocacy services, crisis intervention training, as well as their popular stigma-free program, where “individuals, businesses and organizations learn ways to bring the discussions and personal acceptance of those dealing with mental illness on a level par with discussions and personal acceptance with those who are challenged by less stigmatized ailments such as cancer, heart disease, and diabetes,” May said. This year, a raffle and dinner will accompany the tournament. Citizens are invited to join the Idaho Transportation Department, members of the Blaine County Regional Transportation Committee and the Citizen’s Advisory Committee for the dedication of the new Big Wood River Bridge at 12:30 p.m. Wednesday, Sept. 13. Six locally-inspired sculptures designed and created by former Ketchum resident Kay Kirkpatrick will be featured. Kirkpatrick will be present at the dedication to describe her vision and creation of the art. The ceremony will be held near the south end of the Cold Springs trestle bridge adjacent to Idaho Highway 75 south of Ketchum. Representatives from ITD, members of the transportation committee and the advisory committee will make brief presentations about the development and construction of the bridge. Attendees are asked to park at the north end of Hospital Drive and walk on the Wood River Trail to the dedication site. After about 18 months of construction, final work on the reconstructed Big Wood River Bridge was completed on Aug. 17. TheLLR $5.48-million bridge replacement is the latest project of the Timmer81974 man-to-Ketchum corridor, as outlined in the Idaho 75 Final Environmental Impact Statement comADJUSTABLE pleted in 2008. The new structure includes a widened highway to four lanes and improved wildlife DESK RISER passage under the road. A “Topping Off Celebration” is traditionally held when the last beam (or its equivalent) is placed atop a structure during its construction. Signing the steel beam 10:00a.m. - 10:30a.m. Remarks begin at 10:30a.m. he 2017 elections are approaching, but many races have yet to be announced. The deadline for filing in most municipalities will be by 5 p.m. Friday, Sept. 8. The deadline for candidates to withdraw their candidacy by filing a notarized statement of withdrawal with the City Clerk is Sept. 23. Deadline for write-in candidates to file their declaration of intent with the City Clerk is Oct. 10. Election Day is Tuesday, Nov. 7. In almost every town in the state, there are at least two city council seats open, and in many towns there is also a mayoral race. In Blaine County, Ketchum has a mayoral race between incumbent Nina Jonas and challenger Neil Bradshaw. In Hailey, there are two council seats up for election. And in Bellevue, there are three alderman seats are up for election. While many of the incumbents will run for reelection, one council seat in Hailey is open. 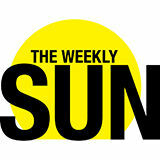 The Weekly Sun will run interviews with candidates over the next two months. The race for Idaho governor, and lieutenant governor, will be held during the 2018 mid-term elections. In 2018, there are no senator races in Idaho, but the two congressional seats will be open. Because incumbent Rep. Raul Labrador is running for governor, his seat will be vacant. Three other Republicans have announced their run for governor, including businessman Thomas Alhquist and Lt. Governor Brad Little. Two Democrats have filed, including Troy Minton, a homeless man from Boise, who advocates homeless issues, and Michael Smith of Post Falls. Three independents, Michael Richardson, John Thomas Wiechec and Adam Phillips, have declared their candidacies. However, filing doesn’t officially start until the end of February 2018, said Shelby Scott, the Idaho Democratic Party digital and media director. “There are several candidates who have have reached out, who are interested in running. We’re confident we’ll have quality Democratic candidates.” To be eligible to run for governor, one needs to contact the Idaho Secretary of State Elections Division to confirm a registered address, complete a Candidate Filing Form, or, as an independent candidate, collect a specified amount of signatures. In 2018, the filing window is from Feb. 26 to March 9 and the primary will be held on May 15. Then, candidates need to file financial paperwork. For more guidelines, visit sos.idaho.gov and scroll down to elections. “One of the things we look for are well-known members of the community who are involved in local issues, who know what their town and region cares about,” Scott said. “Idaho is difficult landscape for Democrats. But we’re up for the challenge in 2018. I don’t believe the Republicans will be able to nationalize the issues. We don’t run and win on boogieman issues.” Scott added that both parties will provide training for potential candidates. “We travel around the state, and we’d be happy to talk about any issues someone might have about running,” she said. “Maybe they’ll run next time. We’ll talk even if it’s just an inkling.” Scott added that Blaine County, and District 26, is a good area for state politics. “People work hard on elections there,” she said. Local Author to Read At Community Library Part-time Sun Valley resident and resort employee John DePasquale was born in New York and grew up in Rhode Island. Under the name J Dominic, he has just published his first novel, “Reaching Montaup.” The book, written in prose and rhyme, concerns two boys and their shattered lives in Rhode Island in 1965. Dominic will read from and discuss the novel at The Community Library in Ketchum, 6-7:30 p.m. Thursday, Sept. 14. For more information, visit reachingmontaup.com. Submit a photo of your pet to see it printed in this special section! You deserve to feel better today! Members of the Idaho Legislature sent a letter to U.S. Attorney General Jeff Sessions and others regarding the lack of speedy trial and other matters associated with the Bundy standoff trials. WE WILL BE WORKING NEAR YOU As part of ongoing efforts to maintain safe and reliable service to customers in the Wood River Valley, Intermountain Gas will be conducting system upgrades along a section of Elkhorn Road. Construction for this project will begin the week following Labor Day weekend and is scheduled to be completed by Oct. 15. The section of Elkhorn Road to be affected is between Highway 75, east to Juniper Drive. Traffic will be restricted to one lane along the active work zone and flaggers will be present to manage both directions of traffic. Intermountain Gas is dedicated to the safety of its employees and the pubic and urges drivers to use caution and reduced speeds through the work zone. Thank you for your patience as we complete this project. On Tuesday, Aug. 29, an Ada County jury concluded unanimously that the Idaho State Police retaliated against Brandon Eller, a detective, after he raised concerns over a fatal crash investigation. After nearly three years of legal wrangling and a nine-day trial, Eller was awarded $1.5 million in damages and $30,500 in lost wages. Eller accused police officials of meddling in an investigation into a 2011 crash in which a Payette County sheriff's deputy struck and killed a civilian. “The only way ISP was going to be held accountable in any of this was by going all the way through a trial and having a jury render a verdict,” Eller’s attorney, Erika Birch, said. Eller, who still works for the agency, sued under the Idaho Protection of Public Employees Act, which protects “the integrity of government by providing a legal cause of action for public employees who experience adverse action from their employer as a result of reporting waste and violations of law, rule or regulation.” This was the second Ada County jury to support such a whistleblower claim this year. Colonel Kedrick Wills, ISP director, said they were disappointed in the outcome of the trial. “But we respect the legal process and the rights of our employees to pursue their legal rights,” Wills added. Amanda Breen, Ketchum attorney, has filed her candidacy for Ketchum City Council. “I’ve been a homeowner and entrepreneur in Ketchum since 1999,” Breen said. “I know what a challenge it can be to live, work or start a business in our beautiful city. Every time the City Council makes a major decision, it needs to ensure that the decision has positive effects on affordable housing, business and real estate development, and keeping our tourist economy strong.” Breen plans to emphasize to city officials the diverse opinions that she hears from fellow residents about local issues. “City government must listen to our residents and our business owners before proposing major expenditures, and it needs to ensure that our residents are fully informed and included in all such decisions,” she said. With degrees from Stanford University, the University of Utah College of Law, and University College London, Breen is the managing attorney of Amanda Breen Law, PLLC, focusing her law practice on immigration law and family law. She is also a contract public defender for Blaine County, asserting the constitutional right of indigent defendants to legal counsel. Breen is president of the board of directors of The Advocates for Survivors of Domestic Violence & Sexual Assault in Hailey; she is Idaho chapter chair of the American Immigration Lawyers Association; and she serves on the steering committee of the Idaho State Bar’s Idaho Academy of Leadership for Lawyers. For more information, go to www.amandabreenforketchum.com and www.facebook.com/amandabreenforketchum. NEWS PHOTOS Twenty second prizes were also awarded in the random drawing. In correlation with the Symphony’s celebration of 10 years performing in the R.E. Holding Sun Valley Pavilion, these winners received a coffee-table book, which documents the inspiration, architecture and construction process of the Sun Valley Pavilion. National Suicide Prevention Week runs from Sunday, Sept. 10 through Saturday, Sept. 16. This year’s theme, “Take a Minute, Save a Life,” will focus on raising awareness that suicide is a major preventable cause of premature death on a global level. The Crisis Hotline, based in Hailey, asks people for their help in supporting suicide prevention. The Crisis Hotline is committed to building a more resilient community for those in a crisis situation who need immediate help. Personal crisis knows no economic, age or social boundaries. The Crisis Hotline is available 24/7 to provide a compassionate ear, encouragement and hope, and offers free confidential services through crisis intervention, suicide prevention, and referrals. “My Life Matters,” the Crisis Hotline teen suicide awareness and prevention program, begins in the schools Monday, Sept. 11, to provide presentations to students with real-life intervention strategies. For anyone needing information/materials about suicide to help a friend or loved one, call the Crisis Hotline office at (208) 788-0735. For 24/7 confidential support, call the Crisis Hotline: 208-788-3596 or visit Crisis Hotline.org. Idaho’s Superintendent of Public Instruction, Sherri Ybarra, is seeking a 6.8 percent increase in education spending for 2018, describing it as a budget with no surprises and no new initiatives. If approved by lawmakers in January, Idaho’s public school funding would bump up nearly $114 million more than what lawmakers allocated this year for a total of $1.78 billion. An ongoing key feature of Ybarra’s budget is more teacher salary funding, which is part of a five-year plan to boost school employee pay. Ybarra wants $46.6 million more for teacher salaries, which would boost pay for new teachers to $35,800 a year for fiscal year 2018-2019. For operational funds, Ybarra requested $27,683 per classroom to be used at their own discretion—a coveted fund that has gradually been replenished since lawmakers slashed it in the peak of the economic recession. The request is about $900 more than last year. The proposal now goes before Gov. C.L. “Butch” Otter, legislative leadership and other stakeholders for review. Otter will also submit his own education budget for legislative consideration during the 2018 session. The West Coast is ablaze, and the thick smoke is spreading through areas far removed from the actual fires. At last count there are 81 fires burning in California and the Northwest, 22 of which are in Idaho. Currently, 12 fires are under the Payette Wilderness fires listing. The total acreage covered by these fires is 31,036 acres, with the Highline Fire being the largest of the fires at 29,036 acres. The Highline Fire began as a lightning strike on July 28, 2017 four miles north of the Chamberlain Basin in central Idaho. The Salmon-Challis National Forest and the Nez Perce-Clearwater Forests are also the sites of several fires each. Smoke from the Ibex Fire (Salmon-Challis National Forest), Bearskin Fire (Boise National Forest), Highline Fire (Payette National Forest), Honeymoon Fire (Middle Fork Ranger District, Salmon-Challis National Forest), and fires burning in Montana continue in the surrounding areas. According to the Idaho Department of Environmental Quality, monitor observations are currently reading in the Moderate to Very Unhealthy level for an hourly reading. This past weekend saw conditions deteriorate each day to levels that reached the Very Unhealthy category for a 24-hour Air Quality Index over the Labor Day holiday. a reception at the American Legion Hall at noon. One measure of academic student performance is the Idaho Standards Achievement Test, or ISAT. “The ISAT is one part of an academic checkup that lets teachers, parents and school leaders know if student learning is on track,” Dr. GwenCarol Holmes, Blaine County School District superintendent, said. Overall ISAT scores for BCSD students are slightly above the state averages. “There are students who are not yet proficient on the assessment and the expectation is that all students can and will be proficient,” Holmes said. “Closing the gap between students who are not proficient and proficient continues to be the focus for our district.” The Blaine County School District Board of Trustees asked for a targeted plan to address the achievement gap last spring. Superintendent Holmes identified student engagement, elementary reading and academic language as the three main focus areas for 2017-2018. “We want all students engaged with their head, heart and hands, and teachers who know all students by name, strength and need. We want all students reading at grade level by the time they leave elementary school. By developing a deep understanding of the academic language within each content area, all students will improve reading, writing, and thinking like mathematicians, scientists, economists, etc. All of these are essential to increasing proficiency,” stated Holmes. In order to gain clarity for instruction and to improve student engagement, Blaine County School District staff began the school year by analyzing the complexity of the standards and sample ISAT items that assess the standards. “Students are more engaged when both students and teachers are clear about what is to be learned and how students will demonstrate what they learned to meet high academic expectations,” said Angie Martinez, director of curriculum, teaching and learning. “By working together, we can close the achievement gap.” Parents may contact Dr. Marcia Grabow at (208) 578-5411 or mgrabow@blaineschools.org with questions about the ISAT data. slow cool-down is headed to the mountains. With this seasonal occurrence, we should expect to see the first big changes from our summer fishery to our fall fishery. In the meantime, all the same bugs and techniques we’ve used over the past few weeks are still in play this week. Silver Creek is beginning to see more and more Baetis activity—a sure sign that fall is coming. The Trico Spinner Falls begin to wane as the Baetis cranks up. Expect to see a few Callibaetis Spinners mixed into the morning show, as well. The afternoon activity continues to percolate with Callibaetis activity. Expect this to remain strong as long as the heat continues. The Hopper action on the Creek remains outstanding and the fish are also still looking for Damselflies. The evenings on the Creek are a smorgasbord of bugs, and we are quickly approaching the best Mouse fishing time of the season. The Big Wood continues to impress as the fishing remains excellent. Parachute Adams in a variety of sizes is a great choice, as well as Hopper patterns. A Dave’s Hopper on the Big Wood is a deadly fly this time of year. It is also time to start putting the Western Red Quill in your fly box and a few October Caddis also. The Upper Lost is also impressive, with fish being caught throughout the system. It doesn’t seem to matter where you fish; Flying Ants, Royal Trudes, Parachute Adams and Hoppers are all good choices. Anglers may see a few Trico takes in the morning, as well. It’s just a matter of finding flat enough water for a big fish to eat them. The Lower Lost has been slightly underwhelming as the Hopper bite continues. The Nymphing has been okay with Copper Johns and small Tungsten patterns. The Crane Fly action is still happening, and skating flies remains one of the most fun ways to fish the river. The South Fork of the Boise remains stuck between optimum wading flows and optimum boating flows. Smaller boats will have an easier time on the river, and wade-fishing anglers will find things slightly more manageable. Hopper, Flying Ants and Pink Alberts are key—and be sure to have October Caddis in case this bug shows early this year. It’s a good time to fill your fly box for fall. Upcoming hatches include Fall Baetis, Mahogany Duns, Western Red Quill and October Caddis. Happy fishing, everyone! are actually displaying anxiety from lack of direction, leadership or structure at home. Dogs that know that there are rules, and know there is positive reinforcement for obeying the rules, are much happier. And almost immediately they become calmer and easier to live with. Anxiety can also be a “needy” dog that we humans misinterpret as that dog’s affection for us. Many dogs that continually need to be petted, or that always lay at your feet, can be dogs filled with anxiety and dependency. We humans, again, interpret this as their love for us when, in reality, many times it is extreme dependence or anxiety. Recognizing dog anxiety is the first step to resolving it. Solutions come in many forms, depending on the personality traits of your individual dog. In my experience, I will say that almost all anxiety can be reduced with a tailor-made leadership program that fits you and your dog. Fran Jewell is an Idaho Press Club award-winning columnist, IAABC-certified dog behavior consultant, NADOI-certified instructor #1096 and the owner of Positive Puppy Dog Training, LLC, in Sun Valley. For more information, visit positivepuppy. com or call (208) 578-1565.
vor, in whatever way we can. I Fran sends her love to her readhave set up a GoFundMe account ers and to all those who have conto help with her medical and liv- tributed. ing expenses. In just a few weeks, Let’s come together now to help we as a community raised nearly Fran in her time of need, $6,500 for Fran. Let’s keep it going! Brennan Rego To contribute, visit gofundme. Publisher com/fran-jewells-medical-fund. Leslie Rego, “Wildfire Totem Poles,” black and white charcoal, colored pencil. artist and Blaine County resident. To view more of Rego’s art, visit Leslie Rego is an Idaho Press leslierego.com Club award-winning columnist, earthed stories. What would make my heart sing more, though, is if the connections between all kinds of people, he latest flood of news coverage is ines- of whatever their racial, religious and economic capable; the country expresses shock at the makeups, could exist positively all the time, not devastation in Texas, and yet another hurri- just in peril. I regret that it takes something as cane, this one called Harvey, leaves a swath of lost tragic and upsetting as a catastrophe of this maglives and homes. nitude to remind us of our humanity. Most of the citizens of this country react with Why shouldn’t our everyday lives display the compassion and generosity, and, if we watch the sense of compassion and respect for others that waters rise on TV, we also witness leaps to the forefront in this kind of heroic acts of rescue and kindness, situation? Why do we have to seek always expected in the home of the something to extol in our behavior free and brave. I affirm the genshortly after the shock of witnesserous instinct that people exhibit ing shameful conduct toward othin these situations. I also note that ers in Charlottesville? Americans are eager to assist relief Maybe if we could picture more efforts during natural disasters ocoften how we would respond if curring outside our borders. needed to rescue a stranded strangUnfortunately, it seems this comer, one labeled by some as “inferipatible behavior does not always or” or “different,” and then carry transfer to our regular daily lives. that image over to our normal lives, One of the flood victims stated we might be able to call up more that she felt there was a positive often the inherent grace and tolerside to this particular disaster, that JoEllen Collins—a longtime ance lying within each of us. Can the goodness of human nature will resident of the Wood River we join hands together even when be even more evident as people rush Valley— is an Idaho Press not in imminent danger? Can we Club award-winning columto help and house those in need. We nist, a teacher, writer, fabric offer that same spirit of concern for sit in our safe chairs and feel a bit artist, choir member and others while we stand secure and smug, proud of our fellows’ heroics unabashedly proud grandma safe in our normally blessed exisas we watch rescuers and victims known as “Bibi Jo.” tence? treat each other with dignity. Yes, Let’s try continuing to display I too have witnessed many earthshaking and hid- goodwill in our daily interactions with each other. eous events in my life, and have been gratified to At least we can practice tolerance and acceptance, see, for example, onlookers join hands to pull a in order to create a safe environment for all of us. trapped woman out of a car just before she would We need not only to rebuild disaster areas but to have drowned, or long lines of volunteers waiting find the ways to demolish the equally disastrous to help flood refugees. These images abound, and impulses we may harbor in our souls. tws they do make my heart sing to see them. nicus and the Swedish botanist and zoologist Karl von Linné became Carolus Linnaeus. Today, we still follow the convention of using Latin or Greek roots to name species, or will “latinize” a modern word or name to hew with convention. Why go to all the trouble? A universal system of nomenclature and taxonomy achieves two goals: it aids with distinguishing between similar yet distinct species while also delineating how individual and groups of species are related to one another based on how they are grouped together. Common names, such as sagebrush or mountain lion, suffice for everyday purposes, yet can prove problematic when precision is required for scientific study. Sagebrush may denote any one of about two dozen similar, but unique, species found across the Western U.S., ranging from the Big sagebrush to the Longleaf sagebrush to the Silver sagebrush, just to name a few. Conversely, one species may have multiple common names, such as the mountain lion, which is alternately known as a cougar, panther, puma, or catamount, depending on where one lives. The grey wolf, for instance, belongs to Kingdom Animalia, Phylum Chordata, Class Mammalia, Order Carnivora, Family Canidae, Genus Canis, Species Canis lupus. Regardless of whether it is locally known as a grey wolf, timber wolf, or Western wolf, it is recognized as a single species that goes by C. lupus. The genus Canis (Latin for “dog”) contains other familiar species, such as Canis latrans (the coyote). If a species has distinct populations that are not different enough to be classified as a unique species, they may be deemed a subspecies and given a third Latin name. Our pet Labradors and border collies, for example, are considered a subspecies of the grey wolf, thus their Latin name is Canis lupus familiaris. Going the other way, like a set of nesting dolls, Family Canidae also contains the genus Vulpes, or true foxes. Continuing all the way up the chain eventually gets you to the Kingdom Animalia which, as the name implies, contains all animals, yet is distinct from Kingdom Plantae or Bacteria. How organisms are sorted into taxonomic groups is informed largely by phylogenetics, the study of evolutionary relationships, but that is a topic best saved for another day. ast week, we learned about the recent designation of the Cassia crossbill as a new species: Loxia sinesciuris. Given how often we celebrate specific species in these pages, it seems like a good time to take a step back and learn about how species get their names in the first place. The study of the scientific classification of natural organisms is known as taxonomy. Aristotle was the first Western thinker to attempt to classify all animals in his Historia Animalium. Within it, he classified animals by characteristics such as whether or not they had blood or lived in water. At the same time, he introduced a binomial naming system to aid with his classification efforts. There was little modification to Aristotle’s taxonomy until the Renaissance, when the discovery of new continents teeming with novel plants and animals, as well as a scientific interest in the medicinal uses of plants, spurred innovation in the field. Gaspard Bauhin was a particularly prolific botanist in the late 16th century who described over 6,000 species of plants and, in the process, was the first person to assign binomial species names based on their “natural affinities.” Bauhin was not the only one naming new species, however, and there was a lot of overlap and confusion. Carolus Linnaeus, known as the “Father of Modern Taxonomy,” finally brought order to the field. In 1735 Linnaeus published Systema Naturae, in which he set out a systematic method of classifying species based on a nested hierarchy of established sets: Kingdom, Phylum, Class, Order, Family, Genus, Species. He also established a set nomenclature, in which every species is described and given a binomial name that starts with the species’ genus (a group of closely related species) followed by a specific epithet; e.g., Homo sapiens. Binomial names are italicized by convention, indicating that they are in Greek or Latin. Both these languages had become the lingua francas of educated circles in the former Roman Empire and were still lauded as essential to a classical education during the Renaissance. Science was conducted in a mix of Greek and Latin, making it logical that a universal naming convention would be based in those two languages. It was not just the honey bee that got a new title (Apis mellifera); scholars were also in the habit of conferring themselves with a classical-sounding Sarah Bahan grew up in the Wood River Valley name. Thus, the Polish astronomer and mathema- and currently works as a veterinarian at Sawtooth tician Nikolaj Kopernik became Nicolaus Coper- Animal Center in Bellevue. Our mission is to inspire, engage, educate, and empower every student. in Hailey. The parade is on Sunday, Oct. 8, heading south through Ketchum. These are free events, with a focus on preserving the colorful history of the sheep industry in our area. The Trailing of the Sheep Festival is ranked among the top 10 cultural festivals in the country by many organizations and travel sites. • The Wood River Farmers’ Markets continue on Tuesdays in Ketchum and Thursdays in Hailey until Oct. 12. Greenchile cheeseburger anyone? They’re the best in the Valley! • The Sun Valley Jazz & Music Festival will begin on Wednesday, Oct. 18, and continues through Sunday, Oct. 22, with five full days of music from 40 bands at several venues in Sun Valley and at River Run. Watch for notices of free concerts and performances. • Mark your calendar for the 26th annual Papoose Club Holiday Bazaar to be held Saturday and Sunday, Dec. 2-3. Seventy artists will display their handcrafted goods and foods, and all proceeds will benefit local children’s organizations. Teresa Beahen Lipman, executive director of the Senior Connection, would like to invite members of our community to come and join us for a special Hoedown Singalong on Sept. 21 at about 12:45 p.m. We’ll sing old-time favorites and songs of the West, with musical accompaniment. These events are always a lot of fun and, as usual, the more the merrier. We are also holding a paddleup fundraiser for the Senior Connection—the second annual Cocktails for a Cause, at Gail Severn Gallery in Ketchum on Oct. 11. Call (208) 788-3468 for more information. In addition to the musical evening, attendees will have a chance to win one of several exciting donated raffle prizes: a Challenger ski pass from the Sun Valley Company; a week for two adults at a Maui condominium; a week in a twobedroom condominium at one of six beachside Mayan Palace resorts in Mexico; a round of golf for four at The Valley Club in Hailey; and a hand-pieced, queen-sized quilt. Raffle tickets are $25 each or five for $100, and are on sale from 4-6 p.m. nightly at Atkinsons’ Market in Ketchum and will be available for purchase at the event. Tickets for this glitzy evening are $150 per person. To learn more about Caritas Chorale or to make a reservation, call Ruth Jones at (208) 622-2704 or visit caritaschorale.org. EVENTS CALENDAR, CONTINUED ON NEXT PAGE HIKIN’ BUDDIES WEDNESDAY SEPTEMBER 6 9:30AM TO 1PM / ADAMS GULCH / KETCHUM The Hikin’ Buddies program, hosted by the Animal Shelter of the Wood River Valley, is held weekly at the Adams Gulch trailhead in Ketchum from 9:30 a.m. to 1 p.m. Attendees can take a shelter dog for a hike, or hang out and socialize some of the smaller dogs. No appointment is necessary; dogs go out on hikes on a first-come, first-served basis. Additionally, the shelter will now be doing adoptions at Adams Gulch during Hikin’ Buddies. An adoption counselor will be on site to help complete the adoption process. HAILEY FARMERS’ MARKET THURSDAY SEPTEMBER 7 3-7PM / E. CARBONATE STREET / HAILEY The Hailey Farmers’ Market is now located on the east side of Main Street, on Carbonate Street. Vendors offer a great variety of fresh produce, prepared foods and crafts. Sun Valley Brewery has a beer garden set up, plus live music through the evening. Food trucks will rotate through weekly. For more information visit wrfarmersmarket.org. TNT THURSDAYS – AGES 10+ THURSDAY SEPTEMBER 7 4-5PM / HAILEY PUBLIC LIBRARY TNT for teens happens every Thursday from 4-5 p.m. Kids, ages 10 and up, meet to play video games. Visit haileypubliclibrary.org to learn more. ERNEST HEMINGWAY SEMINAR THURS SEPT 7-SAT SEPT 9 THE COMMUNITY LIBRARY / KETCHUM “Isn’t it pretty to think so?” the last line of Hemingway’s iconic novel, ‘The Sun Also Rises,’ a novel of unrequited love, of the lost promise of youth, of friendship and shifting alliances, will be the focal point of The Community Library’s 2017 Ernest Hemingway Seminar. Keynoted by Paula McLain, author of ‘The Paris Wife,’ the seminar will examine themes in Hemingway’s novel as well as McLain’s bestseller, Paris and Spain in the ’20s, young love, ambition and betrayal. Additional talks will be given by Arlo Haskell, poet and executive director of the Key West Literary Seminar; Emma Sarconi, Hemingway Research Fellow; and Phil Huss, Community School English teacher. The seminar will also include a panel discussion by Boise State University professors, book discussions of The Sun Also Rises, a film screening, and a dinner. For more information, visit info@ comlib.org. person connections between community members and those who produce their food; and the opportunity to see food production in action through farm tours. No auction or request for donations— just enjoyment and a little education. This inaugural farm dinner was intentionally placed on the eve of our third annual Wood River Valley HarvestFest to provide an additional opportunity to honor our small-family farmers during the height of the harvest season. We owe our farmers a debt of gratitude for their backbreaking work that provides us with good fresh food and well-tended land. For tickets to The Elevated Table, go to localfoodalliance. org; for the Wood River Valley HarvestFest, go to wrvharvestfest.org. Local Food Alliance is a nonprofit whose mission is to create a vibrant local food system in the Wood River Valley. For more information, visit localfoodalliance.org. Girls on the Run participants to girls in the same grade who had never participated in Girls on the Run. In addition, she followed girls in Girls on the Run from pre- to post-season to three months beyond the season to determine if seasonlong improvements were maintained after lessons ended. There are over 70 girls waiting to participate in Girls on the Run here in Blaine County this fall, beginning Sept. 11. They need dedicated community members. Learn more about volunteer opportunities to coach with Girls on the Run of the Wood River Valley by visiting www.girlsontherunwrv.org/ coaching. The two-night Monster Truck Insanity Tour will take place at the Hailey rodeo arena. The monster vehicles will compete in straight-up, tailgate-dragging wheelie contests, heads-up racing, and insane car-crushing, mud-flinging freestyle. The Hailey monster truck lineup is one of the best in the Western United States, featuring Captain USA (defending Hailey Monster Truck champion), Dragon Slayer (former Monster Truck Insanity Tour champion), Kamikaze (a brand-new, stateof-the-art Monster Truck) and Monster Trakker. The Monster Truck Insanity Tour promises a great show and a weekend of motorsports competition and entertainment. Tickets are $16 for adults and $8 for children (3-12) and can be purchased at livealittleproductions.com or at the gate. The Ketchum Farmers’ Market, located at the intersection of East Avenue and Fourth Street, offers fruits, vegetables, flowers, meats, baked goods and more, available through regional organic farmers. MIA EDSALL & FRIENDS TUESDAY SEPTEMBER 12 5PM / KB’S / HAILEY Join Mia Edsall and band members Davis French and Jason Vontver for live music during Taco Tuesdays at KB’s in Hailey. NEXSTAGE DRAMA CLUB WED SEPT 13-THURS SEPT 14 VARIOUS TIMES / VARIOUS LOCATIONS nexStage Drama Club is back for fall and will run through mid-January. Drama Club Sr. will run from 4:15-5:15 p.m. on Wednesdays at the new Sun Valley Performing Arts headquarters at 120 N. Leadville Ave., Ketchum. Drama Club Jr. will run from 3-4 p.m. on Thursdays at the David Ketchum American Legion Hall in Ketchum. Call (208) 726-9124 or visit nexstagetheater.org to learn more. SATURDAY SEPTEMBER 9 8:30AM TO 3PM / BOTANICAL GARDEN / KETCHUM Three Big Trees, the last summer Wildflower Walk hosted by the Sawtooth Botanical Garden and Idaho Native Plant Society, will be held on Saturday. Participants will become “big-tree hunters” and visit three of the largest trees in southcentral Idaho. Called the superstars of their species, champion big trees have been recognized by the American Forests Champion Trees program since 1940. With more than 700 species in the Champion Trees National Register, these big trees are found in the fields, forests, rangelands, and urban parks and yards of America. Idaho has participated in the Champion Trees program since the mid-1960s, with a shared mission of locating, measuring and recognizing the largest individual tree of each species. Walks are free and happen rain or shine. Bring appropriate outerwear, sturdy walking shoes suitable for getting wet, water, sunscreen, a hat and lunch. This walk is rated easy-moderate; one site is 200 yards over uneven, rocky and shrubby terrain. John Shelly (retired Forest Service land manager and INPS chapter president), Lisa Horton (botanist and INPS chapter vice-president) and Kristin Fletcher (Sawtooth Botanical Garden education director) will lead this walk. Carpooling is encouraged, and no dogs allowed. Call (208) 726-9358 for more information. ART HISTORY LECTURE THURS SEPT 14 & THURS SEPT 21 5:30PM / THE CENTER / KETCHUM The Sun Valley Center for the Arts is pleased to announce a two-part art history lecture titled “The Aztecs, Conquest & Early Colonial Art of Mexico,” presented by Dr. Courtney Gilbert, the Sun Valley Center’s curator of Visual Arts. Gilbert’s first lecture, on Sept. 14, will focus on the art and architecture of the Aztecs—a Mesoamerican culture that flourished between 1350 and 1521 in what is today considered central Mexico. Using the broader context of the Aztecs’ complex and sophisticated society as a framework, Gilbert will highlight key examples of Aztec sculpture, illustrated codices and urban planning, including Tenochtitlán, the capital of the Aztec empire, now known as Mexico City. Gilbert’s second lecture, on Sept. 21, will begin with the arrival of the Spanish in Tenochtitlán in 1519 and the impact of their conquest of Mexico on art and architecture throughout the remainder of the 16th century. Gilbert will illustrate the ways in which native artists incorporated European styles, imagery and materials into their work and explore how the Aztecs resisted their colonial rulers. Registration for each of the lectures is $10 for members and $12 for nonmembers. To register, or for more information about other upcoming Sun Valley Center for the Arts events, visit sunvalleycenter.org or call The Center’s box office at (208) 726-9491. NUTCRACKER AUDITIONS SATURDAY SEPTEMBER 9 10AM TO 2:30PM / COMMUNITY CAMPUS / HAILEY CSI announces open auditions for parts in the Nutcracker Ballet that will be performed by the Eugene Ballet in December. Parts are open for ages five though high school as Mice (ages 5-7 from 10-10:30 a.m.), Angels (ages 7-9 from 10:30-11 a.m.), Bon Bons (ages 9-11 from 11 a.m. to noon), Party Children (ages 11-15 from noon to 1:30 p.m.) and Flowers (advanced dancers from 1:302:30 p.m.). Auditions are only on Saturday and dancers must be present at these auditions to gain a part. There is a $5 audition fee. Auditions are conducted by Eugene Ballet and will take place at the Community Campus, Footlight Dance Centre studio, 1050 Fox Acres Road, Hailey. FARM TO FORK TUESDAY AUGUST 29 5PM / KRAAY’S MARKET & GARDEN / BELLEVUE Savor the bounty of the season at The Elevated Table, a farm-tofork dinner in the field at Kraay’s Market & Garden in Bellevue. The evening, a benefit for the Local Food Alliance, will feature a cocktail hour followed by a farm tour and four-course, family-style dinner with wine pairings for the local farm-fresh food from Kraay’s, Waterwheel Gardens, Kings’ Crown Organics, Squash Blossom Farm, Pride of Bristol Bay and Agrarian Harvest. Tickets are $200 available through localfoodalliance.org. MEET-THE-CANDIDATES SERIES MONDAY SEPTEMBER 11 6PM / BLAINE COUNTY COURTHOUSE / HAILEY Blaine County Republicans will continue their meet-the-candidates series with Dr. Tommy Ahlquist, 2018 candidate for governor. The meeting will take place at 6 p.m. Monday, Sept. 11 at the Blaine County Courthouse, 206 S. 1st Ave., Room 300, in Hailey. Contact julie@bcrwidaho.com to learn more about this public event. WAKE UP HAILEY TUESDAY SEPTEMBER 12 9-10AM / WR SUSTAINABILITY CENTER / HAILEY Join The Chamber and the Wood River Sustainability Center for September’s Wake-Up Hailey. Enjoy pastries and coffee as guests network with business owners in the Valley. Don’t forget a business card for a chance to win one of many great raffle prizes. Call (208) 788-3484 to find out more. • Send calendar entry requests to calendar@theweeklysun.com. • Entries are selected based on editorial discretion, with preference for events that are free and open to the public. • To guarantee a calendar entry, buy a display ad in the same issue or the issue before you’d like your calendar entry to appear. Contact Brennan at brennan@theweeklysun.com or 208.720.1295. 1. Simply click the orange “Become a patron” button 2. Choose how much you’d like to pledge to The Sun each time we produce an issue (most patrons choose $1). 3. Welcome to The Weekly Sun, partner! JEEP 2000 Jeep Grand Cherokee Limited, 4.7 V8. Fine condition interior and body. Leather seats, sun roof. All-weather tires in good condition. Needs major engine work. $1000, OBO. Call Tewa @ 208-3091634. Always available by appointment and if we’re here. Wednesday through Saturday 11:00 to 5:00 Always available by appointment and if we’re here. Always available appointment and if we’re here. 509 S. Main Streetby • Bellevue, Idaho Always available by ble by appointment andappointment if we’re here. and if we’re here. This fall, the Sawtooth National Recreation Area will begin reconstruction of the Stanley Lake recreation complex. The project will include relocation of the boat ramp, inlet campsites and restoration of the inlet wetlands. A new campground spur and campsites will be developed, the trailhead will be improved, and a new trail will connect all facilities. Public access to the existing boat ramp, trailhead and campsites will remain open as seasons allow until the new facilities are developed. Phase II will connect a spur off of the existing round-about to Redfish Lake Road in the vicinity of Outlet Campground. Once this connection is complete, access to the Outlet Day Use Area, Outlet Campground, Mount Heyburn Campground, Sandy Beach Boat Launch, Sandy Beach Day Use Area, and Sockeye Campground will need to use the new road off the round-about. In addition, the Outlet Day Use parking lot will be re-constructed and a trail connecting to North Shore Day Use will be developed. Once complete, the segment of road between Glacier View and Outlet will be converted to pedestrian use only. Public access to the Redfish recreation complex should be minimally affected by this project, with short delays expected. Construction will continue through the summer of 2018. Connection Recovery Support Group is back! Ongoing support group for people living with mental challenge; share coping strategies, offer encouragement, receive support. Every Thursday. Unique 47+ acres in Soldier Mt. foothills. 1 hr. from SV. Yearround creek, 900 sq ft slab, 1000 gal underground propane tank, septic, well, wind, solar. 208-481-2016. Lost Black Diamond telescopic walking stick. Red and black in color. If found, please call Becky DeShields (208) 928-7203. Happy to come pick it up. Home Appliances. Freestanding & Built-in. 10% rebate with purchase of 3 or more Bosch Appliances 2014 GCC Edition. From Your Roof to Your Rain Gutter, We’ve Got You Covered! responsible, experienced and great references. Free estimates available for: Homes, condos, offices. Housekeeper now accepting new clients. Mon-Fri 10:30 a.m. to 5:30 p.m. Sat 10:30 a.m. to 4:30 p.m.